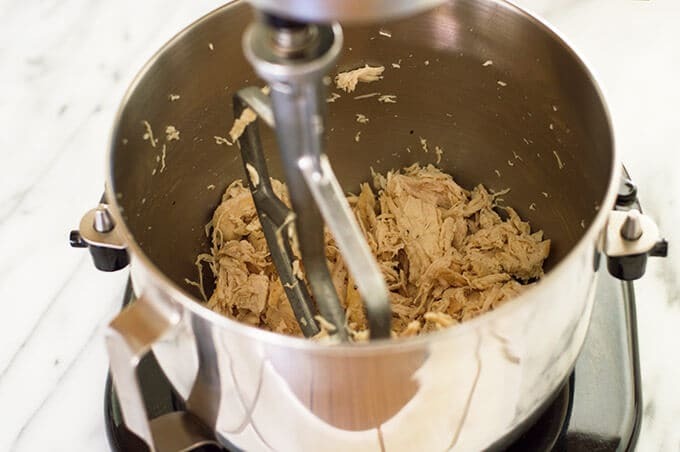 Ever wondered how to cook shredded chicken the best and easiest way possible? Look no further! Your chicken will come out moist and flavorful every time. I’ve been seeing a lot more recipes lately that call for cooked, shredded chicken. 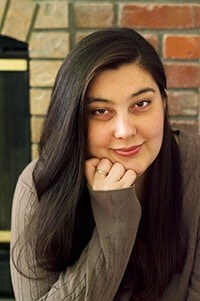 I even have one of those coming up myself in a few weeks (keep your eyes peeled!). Thing is, until recently I didn’t have a great foolproof way of cooking and shredding chicken. My go-to cooking method is usually 3 hours in the slow cooker, buuuuuuuut that method requires planning. And some days (let’s face it, most days) are just not planning days. 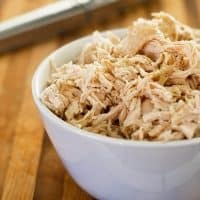 So when I needed some shredded chicken a few weeks ago, I asked the internet how to cook shredded chicken. And the internet was its usual obliging self. It gave me a TON of options. I tested a couple of the easiest/most promising ones, and in the end I slightly adapted a method from Mel’s Kitchen Cafe and begrudgingly tried out a completely crazy-looking tip I’ve been seeing around Pinterest for years (spoiler, it worked). The result? 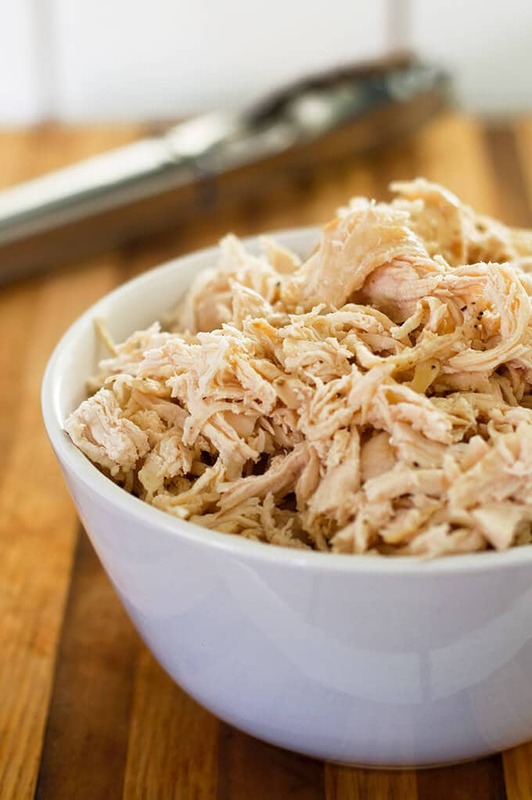 Guys, this is how to cook shredded chicken if you want fast, easy, and TASTY!! The cooking method is a mix between pan frying and poaching. And for shredding, I can’t believe I’m recommending this: use a stand mixer. I know, no one is more surprised than me, but it really does work. I HATE doing extra dishes, and for years every time I saw this on Pinterest I would roll my eyes, but it really does shred chicken well. And I actually timed it. 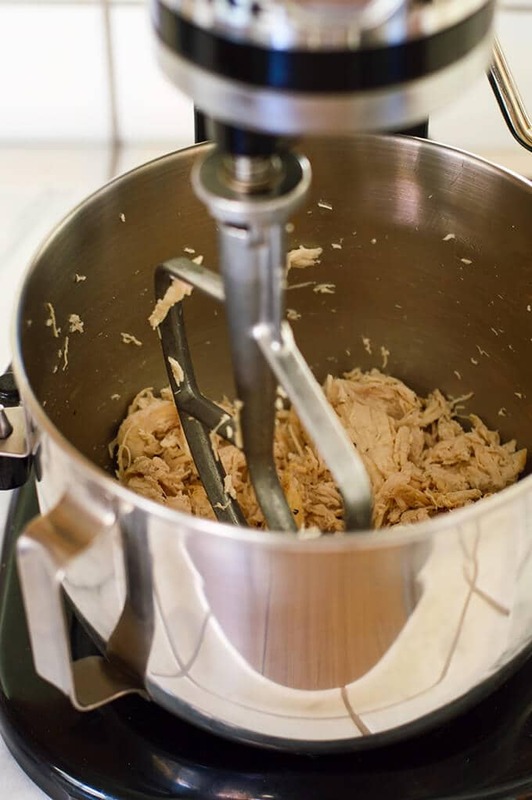 Even washing the extra bowl and paddle, using a stand mixer to shred chicken (if you are making more than one breast) does save you time. Between two sheets of plastic wrap or in a disposable bag, pound chicken just to a mostly even thickness with a meat mallet* (smooth side), rolling pin, or empty wine bottle. If your chicken is already fairly even, you can skip this step. Lightly salt and pepper both sides of the chicken. Heat a skillet with a lid over medium heat. Spray with cooking spray or drizzle on a bit of your favorite cooking oil. Add chicken to the pan and cook until browned, 3 to 4 minutes. Once browned, add about 1/2 inch of water to the pan. Cover and cook for 5 to 8 minutes (or longer if you have large chicken breasts), until an instant-read thermometer* inserted into the center of the breasts reads 165°F. Remove from heat and allow to rest for 5 minutes. Once slightly cooled, transfer chicken breasts to your stand mixer. With the paddle attachment, set mixer to low, working up to medium and process chicken until mostly shredded. Don’t over process–there will be a couple of pieces you will need to finish pulling apart by hand. Not feeling shredded chicken today? Try my post on How to Cook Perfect Chicken Breasts for Salads and Sandwiches. And tell me in the comments, what’s your favorite way to use shredded chicken breast? 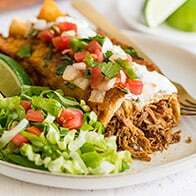 Between two sheets of plastic wrap or in a disposable plastic bag, pound chicken just to a mostly even thickness with a meat mallet (smooth side), rolling pin, or empty wine bottle. If your chicken is already fairly even, you can skip this step. Lightly salt and pepper both sides of the chicken. Heat a skillet (with a lid) over medium heat. Spray with cooking spray or drizzle on a bit of your favorite cooking oil. Once hot, add chicken to the pan and cook until browned, 3 to 4 minutes. Flip and repeat. 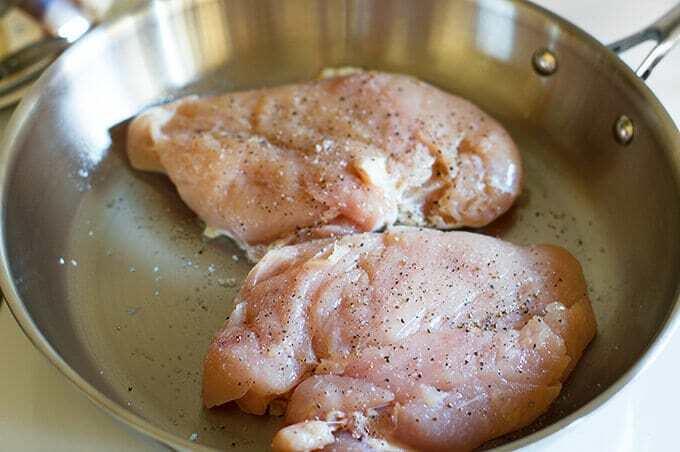 Once browned, add about 1/2 inch of water to the pan, cover and cook for 5 to 8 minutes (longer if breasts are large), until an instant-read thermometer inserted into the center of the breasts reads 165°F. 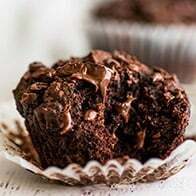 Remove from heat and allow to cool for 5 minutes. 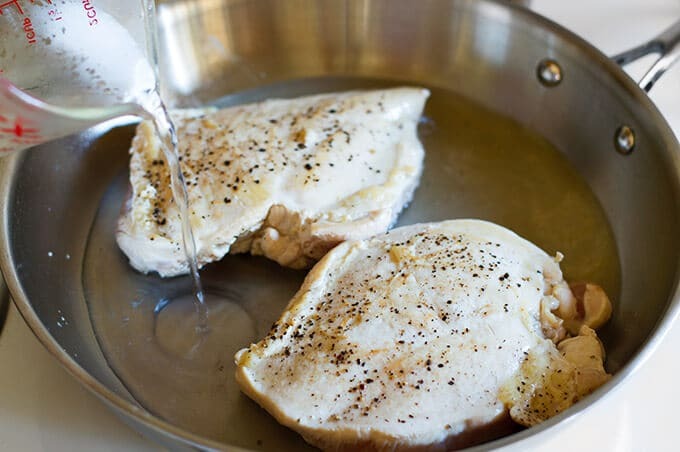 Once cooled, transfer chicken breasts to your stand mixer. With the paddle attachment, set mixer to low, working up to medium, and process chicken until mostly shredded. Don't over process--there will be a couple larger pieces you will need to finish pulling apart by hand. Wash up and use your moist, shredded chicken in something delicious. *Chicken breasts vary wildly in size, so your cooking time may vary. 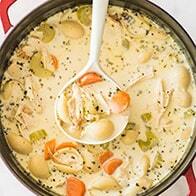 Just cook until your thermometer says 165°F, add water as needed, and you'll be golden. 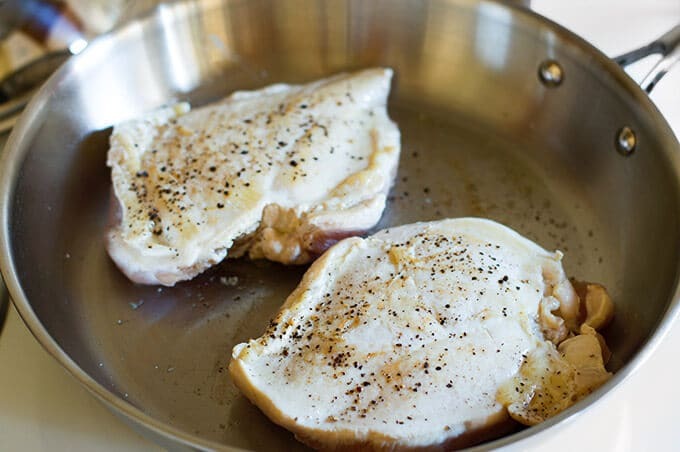 If you have huge chicken breasts, you can cut them in half for quicker cooking times. 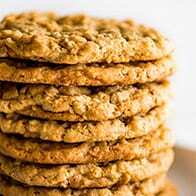 *Links marked with an asterisk are affiliate links, which means I receive small commission if you make a purchase using them. There is absolutely no additional cost to you and it helps keep the lights on around here/pay my student loans.